As in most modern fairy tales, TOKAY’s story begins around a beer, chatting with teammates about life, the universe, and obviously…ultimate. I can’t remember how the subject of ultimate dedicated cleats came into the conversation, maybe arguing about what existing cleat out there had the best grip or ankle support. We talked until late about all the features a ultimate specific cleat had in our dreams. Unfortunately, it was just a fairy tale, and we had to go home and cure our hangovers at work the next day. But I couldn’t forget this crazy idea: What if I created ultimate specific shoes? I’m Robin Lamy, 29, and I am originally from the south of France. I graduated as a product engineer in 2012 and found a job as a consultant in innovation for sport companies. My role was to help companies find new technologies and partners to develop innovative sport gear. This background came in handle with TOKAY, as you might imagine. As many of our generation do, I had to move to another city for my new job, far from my friends. I wanted to make connections there, and sport seemed to be the best way to do it. I needed a team sport (I’ve always been into running, climbing and biking). 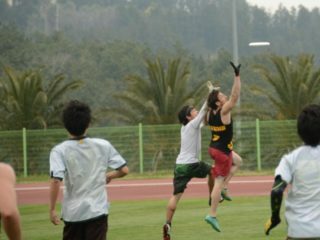 I remembered that a friend had told me about a mysterious flatball, so I contacted the local club ultimate team, Fumble, and started my ultimate career in the fall of 2013. During those first years I had few opportunities to play outside of the club, but on 2016 I took part in a few tournaments and our regional championship. 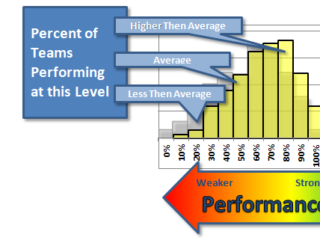 In our Southeast region, few teams are at the national level, and most of us play the regional championship. Each club organises its own tournament, often a hat, which means that we all know each other very well. Most of these tournaments have camping, a party and the fields at the same place. I love that! My best memory in my short career is when I played with a regional team at mixed tournament Talempaya (Geneva, Switzerland). We met some high level teams like Crazy Dogs, and France Mixed (just before WUGC), and I scored against the national team (well, it’s a miracle, but still a nice memory) to take the lead 3-2…though we did go on to lose 3-13. I had this idea of creating ultimate specific cleats. I started investigating what it would take to start such a project, sketched shoes and business plans and jumped in. Like, quit my job, jumped in. Here I was in April 2016, facing this big mountain with no clear idea on how to reach the top. My goal was to make an outstanding model of shoes for ultimate. The first month was dedicated to understand what it takes to start a shoe brand, and what the big issues are (I wrote an article on that here). An early challenge was organized to give a name to the project. I really liked the idea of TOKAY, which is a specie of gecko. Geckos are fast, agile, and stick to everything. They are perfect ultimate players! The logo (thanks Lekio) represents the fingerprint of these Tokays (read the full story here). The next step was the design. To produce a cleat that ultimate players would really like, I asked them what they wanted. I ran an internet survey (here) which I sent to my friends, asking those who completed it to forward it to the players they knew. I gathered more than 1300 answers from all around the world! It was exciting to follow the reach of this survey. I remember the day it hit the USA, New Zealand and China! These answers led us to create a light, durable and comfortable shoe, with great grip. The other major point of the product development was the researching how to make the shoes fit to ultimate movements. We did video analysis of games, and specific movements, and read a lot of articles on ankle protection and studs distribution. With both player feedback and research, I was able to give a complete brief to my designer. The design phase is fascinating. I arrived with a lot of material, and many contradictory requests. We copied parts of football and soccer cleats, but also trail running, basketball and outdoor shoes. We mimicked concepts, drew, drank coffee and had some pretty good ideas (like the inner 3D mesh or the 2 rigidity zones), before arriving to the design you discovered on Kickstarter. Now the next steps were to manufacture it. I traveled to Italy to meet manufacturers and suppliers. It is incredible to visit these factories, full of machines and know-how. I’m working with two footwear specialists, both of them with more than 20 years of experience in footwear industry. Patrick is a footwear developer, after working for some famous outdoor brands, he now has his own workshop to develop and manufacture shoes. Antoine is a passionate footwear designer. After working for brands like Adidas or Warrior, he is now independent. Two others reinforce the team. Gauthier, who is a sport podiatrist and Rohan, who has both a strong resume in ultimate and in bio-mechanical research. This team of four brought all their knowledge to make this project a reality! A fun fact about Rohan, is that he’s a friend of an old friend I hadn’t seen for 8 years. He recognised me at the Talempaya tournament (I still haven’t figured out how!) and that’s how he joined the project! 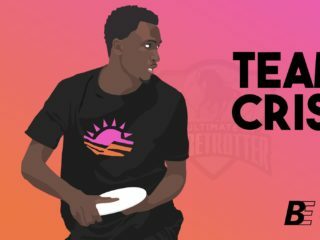 Three ultimate players complete the team, Maïte and Alex, in charge of the design and website, and Quentin, photographer for Get Horizontal, and founder of Focus, a magazine on French ultimate. Our team wouldn’t be complete without Camila, my girlfriend, who supported me when I chose to start this project and has been present at every step. She came up with the name, provided many insights, and forced me to produce size 36 (EU) shoes. She is from Colombia, and dove into ultimate at the same time as me. Starting a brand involves travel. I journeyed to Italy (I’m so happy to work with Italian suppliers! Italy is a wonderful and welcoming country, with outstanding ice cream! 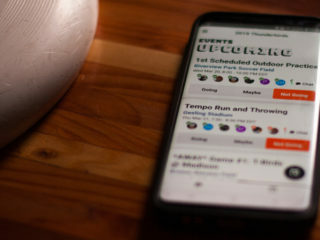 ), London (for WUGC) and Frankfurt (for European championship EUCF) – all were amazing experiences. Robin visits WUGC in London. 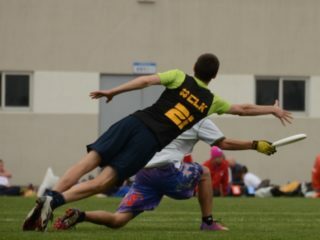 Through this project I had the opportunity to meet Mario O’Brien (RISE UP), Melissa Witmer (The Ultimate Athlete Project), Jim Gerencser (ERIC and Dallas Roughnecks), Amanda Moore (who wrote this article about injuries in ultimate for us), the future testers of TOKAYs and many others. It is amazing to find shared values with and learn from people around world. I love learning, and that’s why I created a blog on TOKAY’s website, to share with all the people interested, the knowledge I gathered during this project. TOKAY is a people-focused project by an ultimate player. Today we are running a crowdfunding campaign, which will help us to finish the development of the shoes and produce the first pairs. Our goal is to make technical footwear for ultimate, which allows players to perform at their best. But above all, we want to stay close to the values of our community: the respect – of our teammates, of the environment, and each other. TOKAY’s Kickstarter campaign has reached its funding goal, and is still open for contributions.